iPhone®: models 5S and later are supported. USR IDTM Token is optimized for iPhone 6 and later running iOS 10.3.3 or later. System Requirements: Leash® requires a Mac® equipped with Low Energy Bluetooth (BTLE, or Bluetooth 4.0 and later) and running Mac OS 12 (Sierra) or later. Generally, this means MacBook Air® and Mac mini® models manufactured 2011 and later, MacBook Pro® models built in 2012 and later and iMac ProTM models dated December 2013 and later. Certain Mac models manufactured prior to late 2013 with early low energy Bluetooth (BTLE) hardware may not perform reliably. If you experience this, please email us at support@usrid.net. We’d like to know more. 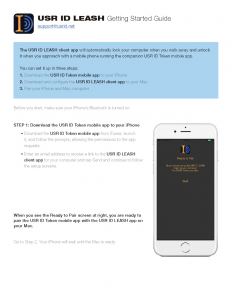 Leash for Windows® and the USR ID Token for Android are coming soon. If you want to be notified when they are available, subscribe to our mailing list. Why does my computer lock and unlock while I am using it? The app’s Bluetooth proximity preference may be too sensitive. Try changing it to be less sensitive. Go to Settings on the app, scroll down to Advanced Settings – Token Proximity – and click the setting one increment more toward “far” from where it is currently set. Save your change by tapping the save icon in the upper right. Occasionally Bluetooth may be affected by interference in much the same way a Bluetooth mouse or speaker may be affected by a quick signal interruption, and this may disrupt your session and require you to bring the mobile app to the foreground and tap the ID button. My computer unlocks even though I’m not very close to it. The app’s Bluetooth proximity preference may be set for too far a distance. Try changing it to be more sensitive. Go to settings on the app (marked with a gear), scroll down to Advanced Settings > Token Proximity, and click the setting one increment more toward “near” from where it is currently set. Save your change by tapping Save in the upper right. My computer failed to lock or unlock when I left/approached proximity. Check your computer to make sure the USR ID LEASH app is running (On a Mac, “ID” will appear in the menu bar to the right, near the clock and Time Machine apps). If you locked your computer remotely, then you must tap the “ID” soft key to unlock it. My computer does not unlock after I return to it after a long absence or, in the case of a laptop, after the top has been re-opened. The computer could be asleep. Press any key and USR ID should log you in. The computer may have been manually locked. To manually unlock, open the mobile app and tap the ID button. The USR ID Token mobile app may not be running or your re-authentication interval may have expired. Open the app and re-authenticate your identity if prompted. Your phone may be switched off or have run out of battery power. If you cannot turn on your phone, you will need to manually enter the password to unlock your screen. Why does my Mac lock when I turn off my iPhone? The phone must be powered on for the USR ID Token to do its job. If your phone loses power, the LEASH client views this the same as you walking away from the computer with your phone. The Client App and Token App need to synch up. This generally occurs in a few seconds but can occasionally take a bit longer. My computer locked automatically when I walked away from it (proximity lock), but I do not want the screen to unlock when I return. What can I do? Tap the Token app’s ID button to “Manual Lock” the computer when you leave. The computer will not unlock until you tap the ID button again. “Manual Lock/Unlock” must be active in Settings. If “Require Client Keypress” is active in Settings, the computer will unlock but the screen will remain blank until you press any key. If you disable Bluetooth on your phone, the computer will remain locked until you enable Bluetooth. Can I still use my screen saver normally? Yes, but keep in mind that the USR ID LEASH client app works with the aid of your Mac’s native login operation and screen saver. When your screen saver becomes active, your password is required to unlock the screen. If you are near the computer when the screen saver comes on due to the passage of idle time, this will be seen by LEASH as a user-initiated “Manual Lock,” and you will need to tap the “ID” button on the mobile Token home screen to unlock your computer. The computer will unlock by proximity if you have left and return to the computer. We recommend setting the Screen Saver to come on after at least 20 minutes – depending on how you use your computer and when you wish the screen to lock. My new settings do not take effect immediately. New settings will become active after a new PRC is generated. Will USR ID LEASH log me in after I restart my computer? When you restart your computer you must manually enter your computer’s password the first time you log in. After that USR ID will automatically log you as long as the mobile USR ID Token app is running and authenticated on your mobile phone and the USR ID LEASH app is set to automatically run when you log in. This setting is under System Preferences > Users & Groups > [your user account] > Login Items. Click ‘+’ at the bottom and select USR ID LEASH from the Applications folder. Why is the USR ID Token asking me to re-authenticate? Where is the audit trail and what do the codes mean? What if my iPhone does not have biometric recognition or biometric recognition is disabled? The USR ID Token mobile app will still work with only passcode authentication, but you will be less secure, using only 2 security factors (a secret you know – the Token password, and a token you posses – the mobile phone). To receive the benefit of 3 factor security as intended, we strongly encourage you to activate biometric recognition. Can I use USR ID LEASH for more than one user account on the same computer? Currently you may only use USR ID LEASH on one user account on the same Mac. Can I still use a password to access my computer? Yes, USR ID LEASH works alongside your computer’s existing security system, it does not override it. You may enter your computer password any time the screen is locked to access your computer. I cannot remember my USR ID password. You can reset the password by using the “reset password” link at account login via your USR ID Token mobile app or the USR ID Account web page. What happens if I change my computer password? The USR ID LEASH client app will recognize that it no longer knows the computer password and ask for it. Click on the “ID” icon on your Mac’s menu bar and select “Show LEASH Client Manager.” You will be prompted to enter your computer’s new password. Once you have completed the pairing between your computer and your new phone, your old phone will no longer be able to lock and unlock your computer. On the old computer, choose ‘Logout’ from the USR ID menu. Install and launch USR ID Leash on the new computer. Follow the prompts to login to your existing USR ID account. On the phone, tap Settings > Pair New Computer and confirm you want to switch to a new computer. Follow the prompts and Tap ‘Start’ when prompted by the USR ID Leash client app on your computer. Complete the pairing process as you did when USR ID Leash was installed previously. Is Leash available for Windows? Leash for Windows is in development. Please join our mailing list so we can let you know when it is ready. Is the USR ID Token available for Android? The USR ID Token for Android is in Beta testing! Please join our mailing list so we can let you know when it is ready. Shows the app’s main screen. It need not be active for LEASH to work and we recommend hiding it unless troubleshooting. Temporarily suspends the feature in case you wish to walk away and leave the computer accessible. Allows the user to lock the client screen immediately. Ends the connection between your Computer and USR ID LEASH and your computer will no longer be protected unless you log back in. Checks for a new version of Leash and installs it. The amount of time that elapses before the user must authenticate his identity to the Token mobile app using his password or biometric (fingerprint or facial recognition). The interval is user-defined in the Settings menu from every 2 minutes to once every 24 hours. You may also set this to Never (not recommended for most users). The Token makes a sound when your computer locks and unlocks. After you approach your computer, you must press a key to unlock it. Allows you to lock your computer by tapping the “ID” button on the mobile app home screen as long as you are within Bluetooth range. The computer will not unlock until you press the “ID” button again to manually unlock the computer. Allows you to lock or unlock the computer anytime from anywhere in the world with your mobile phone as long as both your phone and your remote computer have internet connections and the USR ID apps are running on both. Remote lock/unlock works the same as the Manual Lock feature described above, by tapping the “ID” button on the mobile app home screen. Alerts you with a photo if anyone tries to access your computer when you’re away. To account for variations in Bluetooth signal and environmental conditions, the Token Proximity setting allows users to adjust the distance between Token and Client for the Client to be locked/unlocked. When displayed, the PRC is displayed on the Token home screen as nine characters separated by dashes. The Session Refresh Interval is the amount of time that elapses before generation and transmission of a new PRC. The interval is user-defined and can be adjusted in Settings from 15 seconds to 3 minutes. Show on the Token home screen: a tappable link to the audit trail, total number of lock/unlock sessions, date/time of the last session start and end, session state, and time until the next reauthentication. This is ONLY used when you need to establish a connection between your Token and a different computer. Do I need to save changes I make to Settings? Yes. Settings changes will NOT take effect unless you tap Save in the upper right of the Settings screen. From the USR ID menu bar, select ‘Check for Updates’ and download the latest version of Leash. Click on ‘Install and Relaunch’ to use the updated version. If your apps do not update automatically, go to the Updates section of the App Store and update ‘USR ID Token’. When the update is completed, open the Leash App and reauthenticate. Token refers to your mobile phone and the USR ID Token mobile app on it. Your phone is unique to you and therefore a Token. Client refers to the computer you have linked to your USR ID Token mobile app. The computer is a Client of the Token. The Pseudo Random Code is the 256-bit code generated synchronously by the USR ID Token and LEASH apps only after the user has identified himself or herself with the satisfaction of three factors: a password, a biometric and, with the possession of the mobile device, a token. The PRC is the digital output of the USR apps and is sent wirelessly from your mobile device to the client, which is also generating the PRC. If the PRCs match, you are granted access to the client computer. The PRC is sent continuously to the client, proving the user is still present. For convenience, a portion of the PRC may be displayed on the app’s home screen. Leash is a trademark of USR ID Inc. USR ID is trademark of Universal Secure Registry, used under license. Mac®, MacBook Air®, Mac mini®, MacBook Pro®, iPhone® and iMacProTM are trademarks of Apple Inc., registered in the U.S. and other countries. Windows® is a registered trademark of Microsoft Corporation.